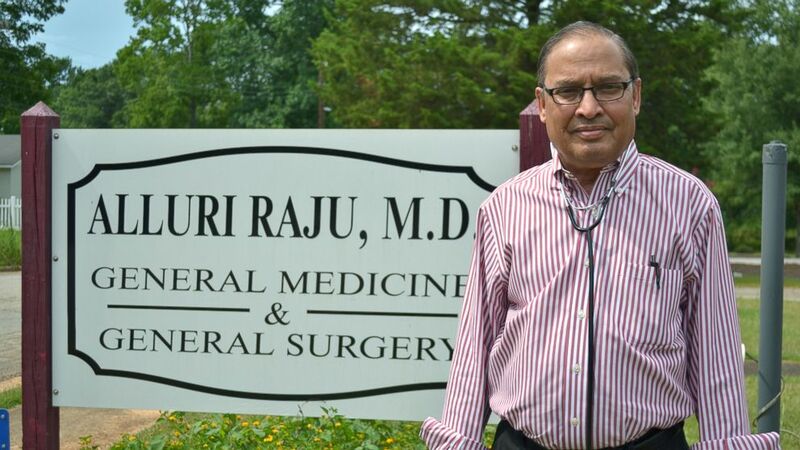 Dr. Alluri Raju, a native of India, vividly remembers how his ethnicity prompted concern and discrimination in the southwest Georgia town of Richland. Doctors there hesitated to grant the family practitioner and general surgeon privileges to the local hospital when he arrived in 1981. Yet, in the 37 years Raju has been practicing in Richland, more than 20 doctors have come and gone and he’s the only physician left — not just in Richland, but in all of Stewart County and neighboring Webster County, an area roughly half the size of Rhode Island with a population of more than 8,000. “Today, I’m it,” he said. And his patients, he said, treat him with respect — and not as a foreigner. The American Medical Association said that, as of last year, 18 percent of practicing physicians and medical residents in the U.S. in patient care were born in other countries. Georgia’s percentage of foreign-born doctors is similar, at 17 percent. Yet President Donald Trump’s focus on securing U.S. borders and restricting immigration — and the bitter arguments between the national political parties on the issue during midterm campaigns — have sown concerns about opportunities for foreign-born doctors. Many of these doctors, like Raju, work in rural areas that are desperate to attract medical professionals. Yet those areas are often reliable supporters of Trump and his strict immigration policies. A recent national poll found that immigration is the top concern for Republican voters. Some health care experts say Trump’s tough stance could make it harder for rural areas such as Richland to relieve critical physician shortages. Dr. Alluri Raju, who has been practicing in the rural Georgia town of Richland for 37 years, said he initially faced discrimination, but that has dissipated. He is now the only doctor in town. Georgia’s Republican lawmakers have considered legislation in recent years that opponents say would have restricted the rights of some immigrants. And Republican candidates for governor here campaigned in the primary this year on cracking down on illegal immigrants, though advocates for that position say bias is not the motivation, but rather the need for border security. These immigrants help fill some of the gaps, especially in primary care, said Dr. William Salazar of Augusta University’s Medical College of Georgia, who came to the U.S. from Colombia. And rural Georgia has a higher percentage of immigrant doctors than do urban areas, said Jimmy Lewis of HomeTown Health, an association of rural hospitals mostly in Georgia. “Foreign-born doctors go to places no one wants to go,” said Dr. Gulshan Harjee, a Tanzanian-born physician who co-founded the Clarkston Community Health Center, a free clinic serving mainly immigrants and refugees in metro Atlanta. Belsy Garcia Manrique arrived in the U.S. from Guatemala at age 7. Physicians from predominantly Muslim countries face increased pressure after the Trump administration tightened its visa and immigration policies. Several doctors said that their visa applications take longer than before or are on hold, and re-entry into the U.S. after traveling was difficult. Nearly half of Muslim physicians in the U.S. felt more scrutiny at work compared with their peers, and many said they experienced discrimination in the workplace, according to a study by Dr. Aasim Padela at the University of Chicago. Nearly a tenth of the physicians surveyed reported that patients had refused their care because they were Muslim. Dr. Buthena Nagi, a native of Libya, is employed as a hospitalist at Navicent Health in Macon. Nagi, 40, completed her residency at Morehouse School of Medicine in Atlanta in 2015. But to stay in the country she has to meet immigration criteria. Nagi wears a hijab — a traditional head covering for many Muslim women — with her scrubs, and sometimes patients and colleagues ask her about it. At age 7, she left her home in Zacapa, Guatemala, and headed north through Mexico with her mother and sister. It was a two-week odyssey — a combination of walking and driving — up to the southern tip of Texas. Her father, Felix, who had come to the U.S. two years earlier seeking political asylum, met them and drove the family to his home in Georgia. For many years, she dreamed of being a doctor, hoping to treat Spanish-speaking patients in the parts of northwest Georgia where she was raised. U.S. immigration policy, however, blocked her path to medical school. She was not a legal resident. Most states, including Georgia, prevented undocumented immigrant children like Garcia Manrique from qualifying for in-state tuition at public universities. Garcia Manrique is finishing medical school and applying for a residency program to train in family medicine. Only two Georgia medical programs — at Emory University and Morehouse College — said they would consider a DACA recipient. She applied to both. Of her 50 applications, Garcia Manrique received interview offers from nearly a dozen programs, including ones in Illinois, California and Washington. She hasn’t heard from the ones in Georgia. And these days she isn’t sure if the Georgia she knew, and the Georgia she loved, is a place where she’d feel welcome.